This is a scarce Hand Signed Colour 12" x 8" Photo of the former British Trap shooter who won Olympic Gold at the Mexico Olympics in 1968. John Robert (Bob) Braithwaite MBE (born 28 September 1925) is a British trap shooter who represented his country at the 1968 Summer Olympics in Mexico. Born at Arnside, Cumbria, and educated at the Friends School Lancaster and Edinburgh University, Braithwaite qualified as a Veterinary Surgeon in 1947. Already a notable game shot, in 1956 he began competing in trap shooting events and within a short time he had become one of the country's leading target shooters. In 1964 he gained a place in the British Shooting Team for the Tokyo Olympic Games where he was placed 7th in the Trap Event. Qualifying again for the 1968 Games in Mexico City his busy veterinary practice provided him with little time to travel to the few training grounds available. Instead he installed a powerful oscillating trap on a piece of ground known as Rough Lot, adjacent to the Braithwaites' old family farm. With the help of the local priest, who volunteered to operate the trap, Braithwaite would shoot 50 targets twice a week. At the Mexico Games the trap event consisted of 200 targets in eight stages shot over two days. In the first stage Braithwaite missed two targets. He then proceeded to break every one of the subsequent 175 targets equalling the Olympic record and earning for himself the Gold Medal. 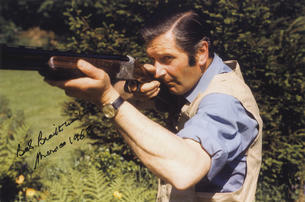 He shot alongside fellow GB and friend, Eric Grantham from East Yorkshire. Though he won many other events during his career inevitably it is for his Olympic victory that he is best remembered. Braithwaite's achievement represents one of the last occasions in the history of the Olympic Games in which a gifted amateur with steely determination and great skill won over a field consisting predominantly of commercially sponsored and government funded professionals.